Susan Hyatt and Michael Carter of Deep Green Resistance Southwest Coalition have published the third essay in their Restoring Sanity series: "Medicating." The essay speaks to those struggling directly with or supporting loved ones caught in alcohol or drug addictions, tying these methods of escape to the oppression and stresses we all receive from civilization. Will Falk, a Deep Green Resistance member in San Diego CA, highlights the front-line struggle of indigenous communities across North America against ecocide in its many forms. Despite the impression given so many of us from school and history books, genocide is not just a thing of the past; it continues every day in the present. Falk calls on all those who benefit from settler culture to step up and stand alongside indigenous people fighting for justice and for the future of all of us. Read the rest of Stand with Indigenous Peoples, Stop the Pipelines. The best UK example of what we are advocating for is the 2008 solo action against Kingsnorth coal power station in Kent. Someone climbed two three-metre (10ft) razor-wired, electrified security fences, walked into the station and crashed a giant 500MW turbine before leaving a calling card reading "no new coal". This person walked out the same way and hopped back over the fence. Their actions halted power for four hours and illustrate the potential which direct action has to really make people sit up and notice. This action also shows the vulnerability of industrial infrastructure and what's possible if someone is motivated enough. 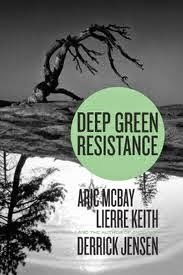 Read the rest of the article "Deep Green Resistance in the UK"
Excerpted from Chapter 1 of the book Deep Green Resistance: Strategy to Save The Planet. A black tern weighs barely two ounces. On energy reserves less than a small bag of M&M's and wings that stretch to cover twelve inches, she flies thousands of miles, searching for the wetlands that will harbor her young. Every year the journey gets longer as the wetlands are desiccated for human demands. Every year the tern, desperate and hungry, loses, while civilization, endless and sanguineous, wins. A polar bear should weigh 650 pounds. Her energy reserves are meant to see her through nine long months of dark, denned gestation, and then lactation, when she will give up her dwindling stores to the needy mouths of her species' future. But in some areas, the female's weight before hibernation has already dropped from 650 to 507 pounds. Meanwhile, the ice has evaporated like the wetlands. When she wakes, the waters will stretch impassably open, and there is no Abrahamic god of bears to part them for her. Read the rest of The Problem of Civilization on the DGR website. The Native Youth Movement has written an important statement, targeted to other native youths, but a valuable read for everyone. It lays out their vision: "to raise babies who are Independent of other humans and machines, knowing the land & water, how to sustain themselves with real skills, working with the Natural Law, Food Harvesting, Building, Healing, Protecting, Clothing, Making Fire, with good Leadership Qualities, Virtues and all the skills for living on the Land in various seasons and terrains." It examines how civilization went so far off track and how the modern "Tech-No-Logic World" and the Internet have expanded centralized control over our lives. It calls on indigenous people to decolonize and restore mental, physical, and social health, contrasting the narcissism bred and encouraged by "Fed-book" (Facebook) with true self-esteem born of serving one's community with useful skills. The statement asks crucial questions including "Are We Stronger Social Beings because of Fed-book?" and "What type of future Adults are we raising today?" The final pages examine the ease of federal data mining and infiltration of social media, and the illusion of organizing by clicking to "friend" someone vs developing real world, face to face, long-term relationships. The annual March Against Monsanto is coming up May 24th. Kim Hill of Deep Green Resistance Australia wrote this speech for the March, supporting direct action and questioning the value of begging those in power to change. Life itself has been stolen from us. Genes, the very basis of life, no longer belong to the living beings who embody them, but to institutions that convert life into profit. Our basic needs, of food and water, no longer come from the land where we live, but from distant corporations that use the exact same food and water as a dumping ground for their wastes. Monsanto executives take up positions of power in the US Food and Drug Administration, and Environmental Protection Authority. These bodies, instead of protecting our food and water as they were intended to do, now protect the interests of those who are causing the harm. Governments exist within the rules of Free Trade Agreements and The World Bank, institutions that exist to protect the profits of corporations. Governments have little power to create change. So we cannot ask governments to act. In India, 250,000 farmers have committed suicide by drinking Monsanto pesticides after their Bt cotton crops, sold to them by Monsanto, failed, and they were no longer able to provide for their families. Monsanto obstructs labelling laws, and suppresses the results of research that are not in its favour. It is not going to listen to the demands of the people. The purpose of a corporation is to make profit, regardless of the costs to other people and living beings. It is not possible for it to act in any other interest. So we cannot ask corporations to act. Even if Monsanto were stopped, there are plenty of other biotechnology companies ready to take their place. The entire economic system is structured to see living beings only as an opportunity for profits, or as standing in the way of profits. For life to continue, the entire system needs to be dismantled. It is up to us to act. As human beings, we are part of a natural community of rivers, forests, soil and myriad living beings. This community provides our food and water. We need to act, not as consumers, not as citizens, but as humans. We are accountable not to profits or institutions, but to the land that provides for us. Actions that ask governments and corporations to change – rallies, petitions and letters – can never be effective on their own. Those who are profiting from the theft of life itself need to be physically stopped. Every day, people are taking real action, by destroying GM crops, sabotaging equipment and infrastructure, and engaging in cyber-attacks against corporations. These actions are essential to stop Monsanto and all those profiting from the destruction of living communities. On behalf of those whose lives have been stolen and manipulated for profit, those who cannot speak and cannot act, we need to give our full support to the people who are risking their own lives and freedom to defend life itself. Reinforcing boundaries shouldn't be up to any single individual. This group of anarchists decided enough was enough after a friend was subjected to the unrelenting harassment of an abusive ex-partner. Social repercussions can and do influence behavior. What follows is a useful tactic for anyone struggling to maintain their personal boundaries against abuse. Our goal was to read a letter of demands to him and then turn around and leave silently. This was not going to be a discussion or a dialogue. This was an ultimatum and a warning. Every Sunday, Derrick Jensen interviews an activist for Resistance Radio, asking great questions about their work, how they got into it, and how other people can get involved. Last Sunday, Jensen interviewed Ben Barker, a writer, activist, and farmer from West Bend, WI. He is currently writing a book about toxic qualities of radical subcultures and the need to build a vibrant culture of resistance. Barker has been a long-time member of Deep Green Resistance Wisconsin, has served in the past as DGR staff, and has contributed in crucial ways to getting the organization up and running. In this interview, Ben talks about his experiences in and the differences between movements for social change vs subcultures, which he defines as style-based groupings of people content to exist in opposition to a cultural mainstream without making serious efforts to change it. He reassures those new to radical activism that there are options beyond such dead-end subcultures. Play the podcast below, or listen to the interview on the DGR Youtube channel. Stop Thinning Forests was launched by a Deep Green Resistance Colorado member whose family participated in the Forest Service's suggested forest thinning projects for private landowners. The website shares the devastating results, including before and after photos. The site carefully documents the evidence that this sort of thinning harms forests and all their community members while increasing risk to homeowners of catastrophic fires. An important read for anyone living in areas where the Forest Service is pushing these policies! It is our hope individuals using this website will see past the rhetoric that is being used by the Forest Service and the timber industry to convince the public that thinning will keep our homes and forests safe and healthy. It is clear that catastrophic fires are caused by climatic conditions and, as the weather changes and droughts sweep over the west, there is little we can do to stop fires. Perhaps taking a serious look at climate change and human behaviors that accelerate change, along with the insatiable desire to log our forests, would be a more effective way to address the situation. Most importantly, take a walk into the forests and find a thinned area. Sit in that area a while and then find an area that has not been thinned and do the same. Think about the land, the ground, the living beings who depend on those areas and decide for yourself which place is truly healthier. The indigenous Wet’suwet’en are holding the fifth annual Unis'tot'en Action Camp to blockade the construction of the Canadian Northern Gateway pipelines, a cluster of pipelines meant to carry tar sands crude and natural gas from fracking operations. This blockade is a strategic way to fight against these extremely dangerous and destructive projects. 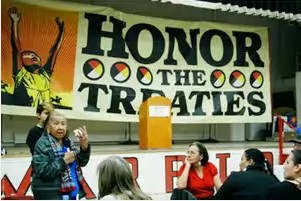 The Unis'tot'en territory has never been ceded to Canada, so the Wet’suwet’en have both a legal standing and a deep commitment to defending their landbase. This is a battle that can be won by defenders of the land and climate change activists.